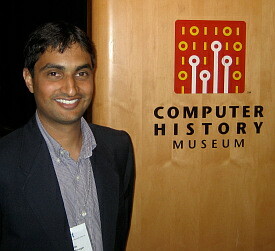 Representing Google was Ragen Sheth, its lead Product Manager and the person credited with inventing Google Apps. After he finished speaking I was able to grab a few minutes with Ragen to learn more about what Google’s been doing in the Cloud. Check it out. Rajen Sheth of Google Apps. How Google Apps is Google’s platform for businesses to run applications in the cloud. Google App Suite is all about bringing the cool things Google has created on the consumer side and presenting it to the businesses. Gmail opened up a whole new model for people to build web-based applications by bringing in AJAX. Over the last 3-4 years a lot of really advanced apps have been built in the browser that utilize the unique leverage points of the cloud. CIO’s have switched from “no way,” to talking feature sets when the subject of the cloud is brought up. Is Rajen seeing more cloud-interest from big or small companies? When will we hit the Cloud tipping point? More Google tomorrow when I post a video I did with with Rajen’s partner in crime, Kevin Gough. This entry was posted on Monday, February 2nd, 2009 at 2:38 pm and is filed under Uncategorized. You can follow any responses to this entry through the RSS 2.0 feed. You can leave a response, or trackback from your own site.